America’s unique prosperity is based on its creation of a middle class. In the twentieth century, that middle class provided the workforce, the educated skills, and the demand that gave life to the world’s greatest consumer economy. It was innovative and dynamic; it eclipsed old imperial systems and colonial archetypes. It gave rise to a dream: that if you worked hard and followed the rules you would prosper in America, and your children would enjoy a better life than yours. The American dream was the lure to gifted immigrants and the birthright opportunity for every American citizen. It is as important a part of the history of the country as the passing of the Bill of Rights, the outcome of the battle of Gettysburg, or the space program. Incredibly, however, for more than thirty years, government and big business in America have conspired to roll back the American dream. What was once accessible to a wide swath of the population is increasingly open only to a privileged few. 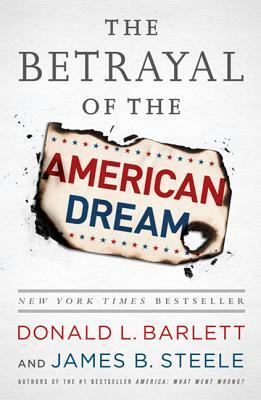 The story of how the American middle class has been systematically impoverished and its prospects thwarted in favor of a new ruling elite is at the heart of this extraordinarily timely and revealing book, whose devastating findings from two of the finest investigative reporters in the country will leave you astonished and angry. Donald L. Barlett and James B. Steele are the nation’s most honored investigative reporting team, and authors of the New York Times bestseller America: What Went Wrong? They have worked together for more than forty years, first at the Philadelphia Inquirer (1971–1997), then at Time magazine (1997–2006), and now at Vanity Fair since 2006. They have also written seven books. They are the only reporting team ever to have received two Pulitzer Prizes for newspaper reporting and two National Magazine Awards for magazine work. They live in Philadelphia.